In this age of technology, you probably don’t think twice about using the ATM at your bank, the self-checkout machine at the supermarket, or various credit card terminals around town. It’s never been a problem before. But a new type of crime called “skimming” may give you pause. Essentially, skimming is the practice of stealing your credit card information, usually through the use of high-tech equipment. Then the thief makes purchases under your name or sells the data to someone else. Either way, you could end up with an exorbitant credit card bill or an empty bank account. Typically, a skimmer installs an electronic device over the actual card reader on the ATM or credit card machine. As your card slides through, the device reads its magnetic strip, capturing your vital financial information. The level of sophistication can vary from cheap skimmers that should be relatively easy to spot to more expensive versions that are virtually undetectable by the naked eye. Usually, the skimming device captures and stores your PIN (personal identification number) as well as the card’s security code. Some skimmers feature a false keypad that goes on top of the actual keypad reading the PIN, while newer devices utilize pinhole cameras mounted above the keypad. The information may be stored locally and picked up by the thief or transmitted via a phone line or even wirelessly. How can you protect yourself against skimming? Here are a few practical suggestions. Look carefully at the ATM or credit card terminal before using it. Although sophisticated skimming devices may be hard to detect, cheaper versions are often clumsily attached to the reader. If something is sticking out or doesn’t fit with the rest of machine, walk away. Before you insert your credit card, pull on the reader or jostle the card around the slot to see if anything is loose. Again, don’t use the terminal if your suspicions are aroused. Be aware of people hanging around the ATM for a long time. The skimming criminal could be lurking nearby to collect the information. 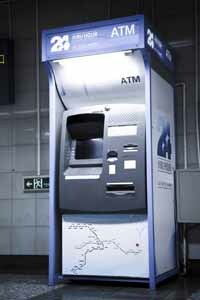 Avoid ATMs in isolated locations that don’t seem to be part of a store or bank. There have been instances where fake terminals have been set up without an establishment’s knowledge. When you enter your PIN, use your free hand to block the view. That can shield your information from a camera mounted above the PIN keypad. Finally, pay close attention to your credit card and bank statements. Fraudulent charges or unauthorized cash withdrawals often indicate that your data has been compromised. If that’s the case, contact your bank or credit card issuer right away.